In the 2-3 months leading up to the opening of the The Ned – a long awaited collaboration between Soho House and Sydell Group to convert the Midland Building into a luxury hotel and members club – it was clear the current specification for the Oculus Stage was not going to be adequate for the type of music programming the client had in mind. The Oculus Stage is a circular piece of marble that sits over the old entrance to the vaults below. With very little time to come up a new design and carry out new building works required the client had been struggling to source a company who could provide a suitable design that could be delivered in the timeframe. Octavius RE was invited to review the site and put forward a solution. The key criteria was that the quality of the system installed should be such that any act, from a small acoustic 3 piece to a world class touring rock band, should be able to play on that stage and have the same audio quality as they would in a professional live music venue. 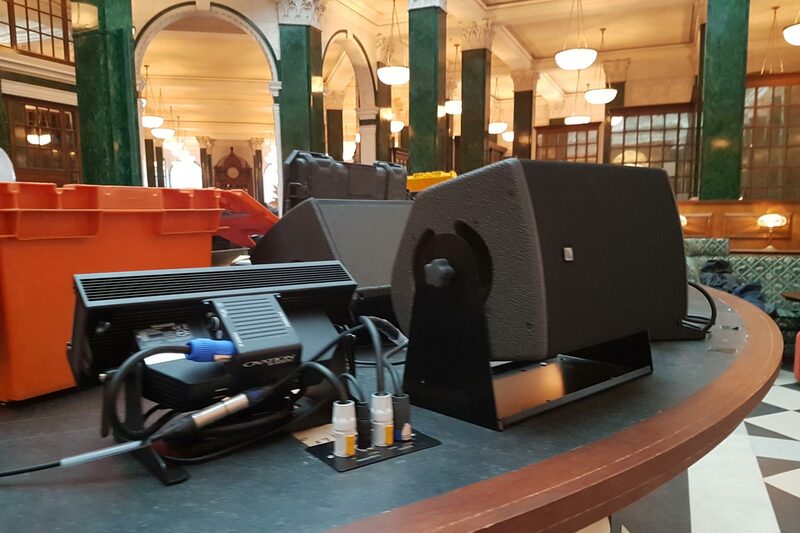 Because live music was such a key aspect we immediately looked at L’Acoustics as the speaker solution as they had the perfect product and it’s a very rider friendly brand. The key concern was delivery, with about 8 weeks to go the hiccup would be getting the speakers and amplifiers in time. A quick phone call to SSE and it was established they had sufficient number of speakers and amplifiers in sales stock and they could make a custom bracket in the timeframe. 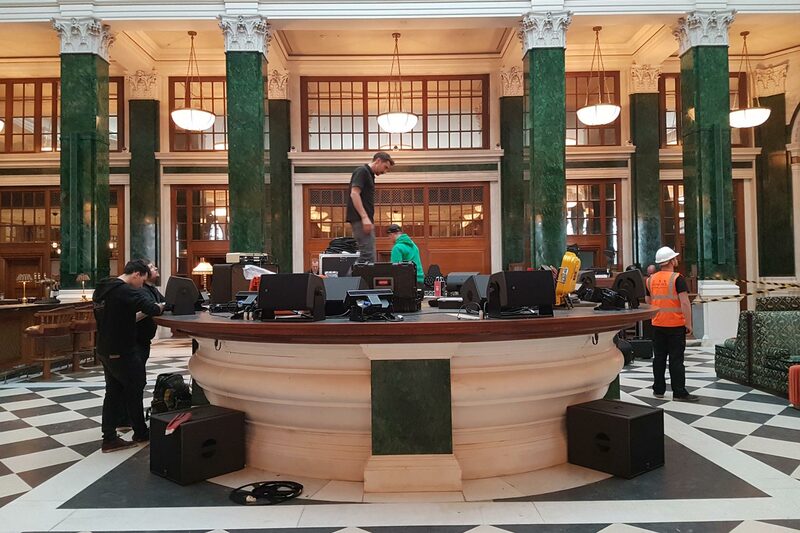 Having established the sound system could be delivered and the design approved, Octavius RE was then invited to project manage the delivery of the live stage technical production including a full, moving lighting rig – supplied by Limelight lighting. With power and cabling needing to be run in during the completion phase of significant construction project it was no mean feat that the solution was delivered successfully and on time and that was in the main down to the quality and motivation of the installation teams from Limelight Lighting and SSE Audio Group. We also had to create a link between the Hotel BGM system installed by ProAV using BSS Soundweb and Crestron Control. We opted for QSys as we needed to be able to create a network between the FOH locations, the amplifier rack that lives in the stage itself and the ProAV rack located in one of the Basements. We used existing network infrastructure and all the QSys products were set up offline as we were waiting for the necessary links to be made by the IT and Pro AS teams. 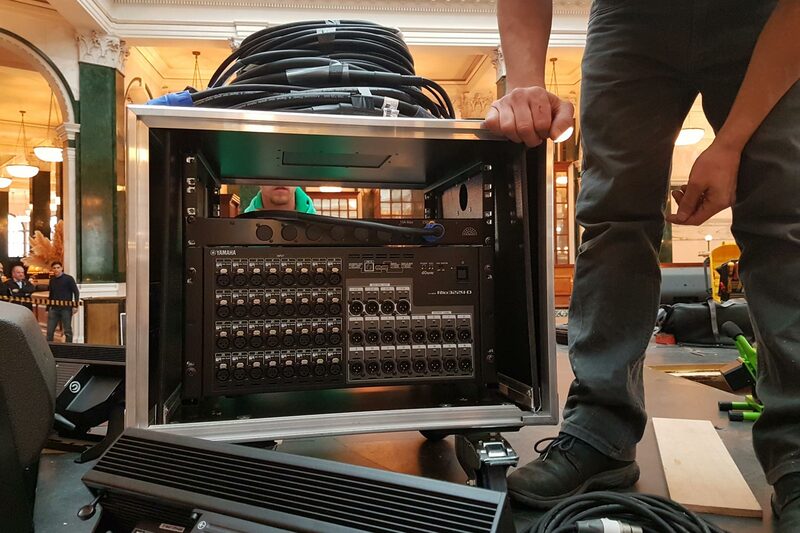 As soon as the physical network connections were live the QSys came online without any hiccups and we could send audio from the live stage to the Hotel BGM system and receive a BGM feed in return. The system itself is a cut down version of a professional music venue solution. There is a pro level digital console and radio microphones, a digital multicore system, tie lines between FOH & Stage. We also embedded Audio & Lighting IO panels in the stage so monitors and floor fixtures could be set up as required and avoid the need to run cabling across the stage (it quite a small space so lots of cabling criss-crossing would have create a serious trip hazard). Even the stage remotes have long tails so the cabling cab run around the edge of the stage from the stagebox. The other neat feature we could provide because we were using Qsys is that you can plug microphones in directly without the need for a desk. This means you can make announcement or speeches without needing an engineer on site – you simply use the Microphone mixing panel on the QSys Touch screen at FOH. 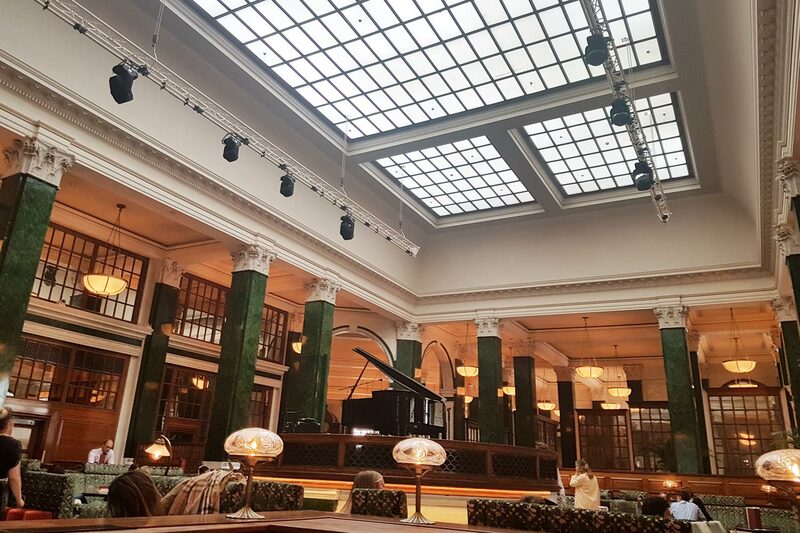 And despite all of this technology you cannot see any of it as it all cleverly disguised, this was achieved by working closely with the Sydell PM team and the Soho House design team.